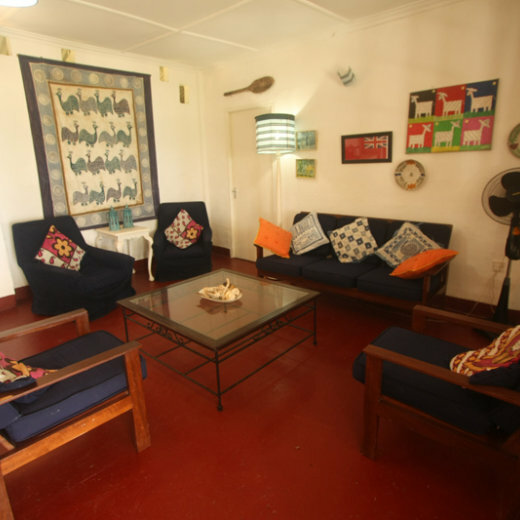 This quiet beautiful beach cottage is situated on Diani Beach near to Kaskazi Hotel and approximately 1km from the shops, banks, restaurants and other amenities of Diani on the Mombasa South Coast. Set in its own secluded grounds of about 5 acres with about 75 meters of direct beachfront at the end of the garden. At low tide you can walk along the beach and the water is excellent for snorkelling and looking at the marine life. At high tide the water can come up right up to the boundary of the property giving you your own exclusive area of beach. The cottage include master bedroom (2/3) with ensuite shower and twofurther bedrooms (3+2) sharing a shower & toilet. Spacious sittingroom with double french doors leading onto a wide shady verandah with fabulous seaviews and private beach, fully furnished, all linen, towels, crockery and glassware are provided. The large reception room has double french doors leading to a wide, wrap-around veranda with table and chairs and 4 sun loungers giving a stunning view straight down to the sea. Set in 5 acres, the grounds are private and are well maintained and the pristine white beach is just 50 metres from the house. At low tide, the coral reef has superb snorkelling and glass-bottom boats and deep-sea fishing are easy to arrange. There is a kitchen which you will not need to know any more about as the resident Cook and Houseboy team - Francis and John, will do all the shopping, prepare and cook all your meals, do the washing up and cleaning. Local fishermen and fruit sellers come daily to the house which is cared for by an excellent cook & garden team. There is also a night askari for security. This place was almost too good to be true! While this isn't a flashy fancy beach bungalow, it's a very cute and pleasant cottage with a fantastic veranda. Lots of privacy, direct view and access to the beach, and not far from the fun spots in town! The price is a great deal. Also, the house staff were incredible, making great food and giving great service. Definitely will go back!